Oil palm grows best in areas with a mean maximum temperature of 30- 320C and on an average of at least 5 hours of sunlight. It can be grown in areas, which receive well distributed annual rainfall of 200cm or more. However, it can tolerate 2- 4 months of dry spell. The oil palm grows on wide range of tropical soils. The adult palms can withstand occasional water logging, but frequently water logged, extremely sandy and hard lateritic soils should be avoided. The fruits are separated from the bunch and seeds are extracted by scraping off the exocarp and mesocarp with a knife, or by retting in water. The seeds are then dried by spreading them on concrete or wooden floors under shade for 2 days. Such seeds can be stored for 3-9 months at about 270C without much reduction in viability. Seeds are soaked in water for 5 days, changing the water daily. Thereafter, the seeds are spread out to dry for 24 hrs. The dried seeds are put in polythene bags and placed in germinator maintained at a temperature of 400C. After 80 days, the seeds are removed from polythene bags, soaked in water for 5 days changing the water daily and dried in the shade for 2 hours. The seeds are then put back into bags and kept in a cool place in order to maintain the moisture content. Germination commences in about 10-12 days. The percentage of germination obtaind by this method is 90-95. Polybags (preferably black) of 400-500 gauge measuring 40 x 35 cm are used. The bags are filled with topsoil and compost and are arranged at a spacing of 45 x 45cm and one sprouted seed is dibbled per bag. A good mulching during summer is desirable. Watering the seedlings weekly thrice is recommended. A fertilizer mixture containing 15g N, 15g P2O5 and 6g K2O at the rate of 8g in 5 litres of water for 100 seedlings are two months and eight months old. It is planted in the main field in triangular system at spacing of 9m accommodating 140 palms/ha. Planting is preferably done at the onset of monsoon during May-June. The polythene bag is torn open and the entire ball of earth is buried in the pit (50 x 50 x 50cm) and levelled. Mg application is necessary only if deficiency symptoms are noticed. Fertilizers are preferably applied in 2 equal split doses (May and Sept), within 2m diameter around the palm and forked in. supply of sufficient quantities of green leaf or compost is advantageous, especially where the soil is poor in organic matter. Dead and diseased leaves and all inflorescence should be cut off regularly up to 3 yrs after planting. When the palms are yielding, judicious pruning to retain about 40 leaves on the crown is advocated. It is necessary to remove some of the leaves while harvesting. In such cases, care should be taken to avoid over pruning. In addition, all dead and excess leaves should be cut off and crown cleaned at least once in an year, usually during the dry season. It is a cross-pollinated crop. Assisted pollination is done to ensure fertilization of all female flowers. However, this is not necessary if the pollination weevil Elaedobius kamerunicus is introduced in the plantation. They congregate and multiply on male inflorescence during flower opening. The weevils also visit the female flowers and pollinate them effectively. First harvest can be taken 3.5 to 4 yrs after planting. When a few ripe fruits are loose/ fall off, the bunch is ready for harvesting. Processing over ripe fruits reduces quantity and quality of oil. A chisel is used for harvesting bunches from young palms. The stalk of the bunch is struck hard with the chisel to cut off and push the bunch out. When the palms become taller, a harvesting hook has to be used. When the palms are too tall, it is necessary to climb the palms for harvesting. 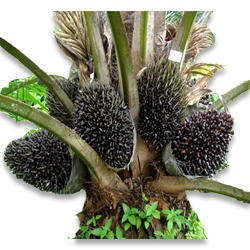 This is a major pest of oil palm in India. These weevils lay their eggs at the cut end of petioles or other wounds. The emerging larvae tunnel into the crown and feed on the growing tissues. Palms infested by the red palm weevil start wilting and leaves show gradually increasing chlorosis and fracture in strong winds. If detected early, treatment of affected palm with carbaryl 0.2% would save the palms. This disease occurs in the nursery. It is recognized by regular or irregular brown to black leaf blotches surrounded by yellow haloes, which develop along the margin, centre or tip of the leaves. It causes heavy seedling loss. The disease can be controlled by spraying mancozeb or captan @ 200 g/ 100 litres of water. Copper fungicides should not be used because of the extreme susceptibility of the oil palm seedlings to copper burn (scorching). This is noticed to affect oil palms of all ages. The incidence is less than one percent. Yellowing starts from tip of the innermost whorl of leaves. Small lesions occur at the distal portions of spear and rotting extends downwards. As the disease advances, new leaves become rudimentary and show rotting. General decline in vigour and production is then noticed. Occurrence of spear rot without yellowing has also been noticed. Distinguishable marginal yellowing of leaflets and sudden drying of leaves showing yellowing are other symptoms. Rouging of all the affected palms may be adopted to prevent further spread of the disease. In early stages of the disease, the affected portions of the leaves may be removed and burnt. Sparse or no fruit set followed by complete drying or rotting of the affected bunches are the typical symptoms. The extent of incidence can be up to 20%. This malady is generally attributed to excess pruning, mutual shading, under-pollination, moisture stress and unhygienic conditions. The situation can be improved by assisted pollination as well as by adopting hygienic measures like removal of infected bunches and dry male inflorescence. For mature plantations not exceeding 40 ha, a hand-operated hydraulic press will be enough for extraction of oil. In the case of large scale plantations, the hydraulic press will not be economical and as such, mechanically driven oil mills have to be established. The fruit bunches brought to the factory are first quartered by means of a chisel. Then are then sterilized in steam or boiling water for 30-60 min. the objective of this process is to inactivate the fat splitting enzymes, which are present in the fruit, which may raise the free fatty acid content of the oil and also to soften the fruit for easy pounding. The sterilized fruits are stripped off from the bunch and then pounded. The pounded fruit mass is then reheated and squeezed using a hydraulic press. It is then boiled in a clarification drum where the sludge will deposit and pure oil float over the water. The oil is then drained out.